Having the best fly fishing reel is a rewarding experience in fishing because it is one of the necessary equipment. You will feel the importance when there is a trophy fish is on the line. This is when a solid reel with a smooth drag system is evaluated. There are numerous options for the anglers that consist of cheap components. Sougayilang flies fishing reel is one among them, which is categorized by both quality and quantity. It is affordable for its cost without sacrificing the quality. Let’s take a quick look at it and know why it is our top choice. A good quality reel cannot be judged by its look only. There are so many things that stand for the quality. Like this, Sougayilang is designed to cover almost every application of fly fishing. Here are some details features of Sougayilang fly fishing reel. 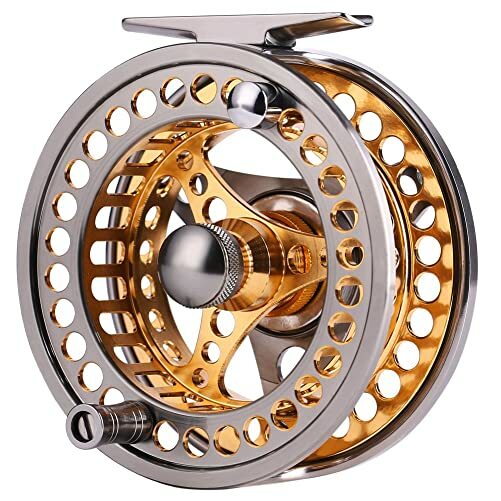 This fly fishing reel is made of CNC machined 6061-T6 aluminum alloy that makes it more durable. This aluminum ensures the corrosion resistance in each environment. Also, the CNC hollow design makes the reel lighter than others. Its large arbor design ensures the smoother and immediate drag. The smooth retrieve is the most important part of this reel. Though the startup inertia is limited its 2+1 bearing makes the return easily. Reels one-way roller bearing engages the drag in one direction. Its advanced drag system allows you to stretch the line toward the target easily. When the front feels a heavy thing, it immediately drags the line forward and backs direction. Reels finely knurled metal screw cap can be used to loosen the spool. So that it becomes easy tochange the side from left to right side retrieval conversion. You can use this fly fishing reel in river, lake, streams, and creeks. It is perfect for all kind of species such as trout, grayling, salmon, and other grasping fish. It’s clear and solid structure allows you to control easily. You won’t face any wobble, side play, and is smooth to handle the reel. You can easily install the reel and also can change the handle with your fishing position. What are the shortcomings of Sougayilang Fly Fishing Reel? If we are talking about shortcoming than there should be such issues that affect the performance. But here we were unable to find except some minor manufacturing issues. Though the reel uses an aluminum alloy, we feel slightly rough edge in hand while fishing. We didn’t find the reels finishing excellent. They should work on this. Also, the drag knob sometimes failed to support backing for Steelhead and Salmon. For the price, these issues can be ignored. Today’s fly fishing reels have a strong machine with excellent performance. This Sougayilang reel stands for all the quality that we consider for a perfect reel. It is a perfect choice for a great value. We assure you that you can catch from smaller spices to a monster high species. It won’t let you face any problem. Also, it could be the best Christmas gift for your father, son, or husband. So enjoy your weekend with great fishing.